When God created the world, he rested on the seventh day (Genesis 2:2). That’s the basis for the biblical Sabbath, when all people and animals rested (Exodus 20:9-11). God set aside days and weeks of rest, and he even rested the earth itself every seventh year (Leviticus 25:4-5). This is the rest we can anticipate on the New Earth—times of joyful praise and relaxed fellowship. Our lives in Heaven will include rest (Hebrews 4:1-11). “‘Blessed are the dead who die in the Lord from now on.’ ‘Yes,’ says the Spirit, ‘they will rest from their labor, for their deeds will follow them’ ” (Revelation 14:13). Eden is a picture of rest—work that’s meaningful and enjoyable, abundant food, a beautiful environment, unhindered friendship with God and other people and animals. Even with Eden’s restful perfection, one day was set aside for special rest and worship. Work will be refreshing on the New Earth, yet regular rest will be built into our lives. Part of our inability to appreciate Heaven as a place of rest relates to our failure to enter into a weekly day of rest now. By rarely turning attention from our responsibilities, we fail to anticipate our coming deliverance from the Curse to a full rest. 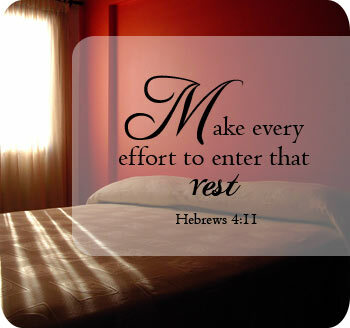 “Make every effort to enter that rest” (Hebrews 4:11). It’s ironic that it takes such effort to set aside time for rest, but it does. For me, and for many of us, it’s difficult to guard our schedules, but it’s worth it. The day of rest points us to Heaven and to Jesus, who said, “Come to me, all you who are weary…and I will give you rest” (Matthew 11:28). What feels better than putting your head on the pillow after a hard day’s work? (How about what it will feel like after a hard life’swork?) It’s good to sit back and have a glass of iced tea, feel the sun on your face, or tilt back in your recliner and close your eyes. It’s good to have nothing to do but read a good book or take your dog for a walk or listen to your favorite music and tell God how grateful you are for his kindness. Rest is good. So good that God built it into his creation and his law. Some people thrive on social interaction; others are exhausted by it. Some love solitude; others don’t. On the New Earth, we’ll likely all welcome the lively company of others but also crave times of restful solitude. We’ll enjoy both. We catch glimpses of being able to enjoy both work and rest at once. I used to feel this when body, mind, and the beauty around me sometimes “kicked in” on a ten-mile run. I’ve experienced the same thing bicycling, when I’ve felt I could ride forever and the pedaling I was doing was part of a great rest. I can be working intently at something I love yet find the work restful and refreshing.